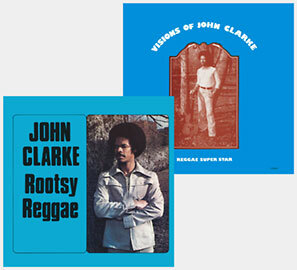 Visions Of John Clarke was a little thrown together for its original release in 1979. Still, its sleeve carried a ringing endorsement from Bullwackies himself - President of the John Clarke Fan Club - and the album attracted the interest of no less than Studio 1 boss Coxsone Dodd, whose bid for distribution-rights was thwarted when the Brooklyn label Makossa quickly put in for a full licence. Out soon afterwards, the new version - entitled Rootsy Reggae - duplicated five tracks, but with markedly different mixes, fresh edits, and sometimes new instrumentation. This CD presents both albums complete with the original track order. The singer - not to be confused with Johnny Clark - had been running with the Wackies operation for the past six years, ever since moving from Jamaica to New York. He’d cut memorable sevens with co-founder Munchie Jackson for the Tafari label - like In Search of The Human Race and Recession - and with Lloyd Barnes for such Bullwackies imprints as Versatile and Wackies. Several are collected by these two albums, with another layer of modification: for example, on Wasn’t It You Lloyd Barnes and Prince Douglas give a new treatment - and adding guitar - to the Jumbo Caribbean Disco twelve; on Pollution they remove the horns from the Wackies seven (though generally Baba Leslie is in full effect here). The tracklisting rounds out with a Johnny Osbourne cover; several New Breed jams, featuring the likes of Jah Scotty, Clive Hunt, Harold Sylvester, Jah Hitler, Jerry Johnson, the Love Joys, even Mickey Mouse apparently; and on a handful of done-over rhythms Clarke takes the mic from brethren like Joe Auxumite, K.C. White and Wayne Jarrett.